Barrington — along with much of southern New Jersey, Philadelphia and beyond — is under a tornado watch at this hour, according to the National Weather Service. The watch — in effect until 7 p.m. Tuesday — means conditions are right for a tornado to form. The National Weather Service also has issued a wind advisory for the region and cautions about gusts up to 45 mph. While tornadoes are not common in South Jersey, one was confirmed earlier this month in Mount Ephraim. 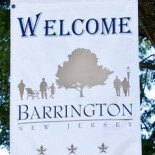 This entry was posted on September 18, 2012 by Barrington Bulletin in Region and tagged tornado, weather.